"Raymond Carver is mostly known for his short stories which focus on blue-collar experience and ordinary people. His style of writing has been classified as 'dirty realism,' and he describes himself as being 'inclined toward brevity and intensity.' Less well-known is Carver's poetry. Like his short stories, his poetry is deceptively simple and straight-forward. And like his short stories, Carver is able to paint a literary masterpiece with the barest essentials. This collection contains all of Carver's poetry—published and unpublished. If you're a fan of Carver, this collection is a must-have." 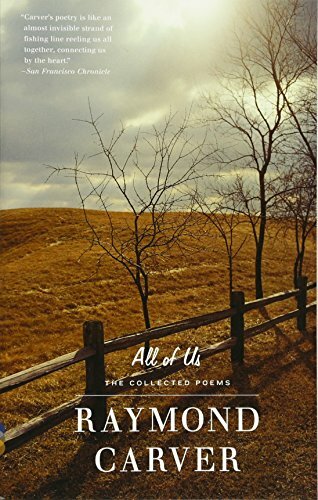 Section Poetry / All Staff Suggestions / Fiction Suggestions / Michael R.
This prodigiously rich collection suggests that Raymond Carver was not only America’s finest writer of short fiction, but also one of its most large-hearted and affecting poets. Like Carver’s stories, the more than 300 poems in All of Us are marked by a keen attention to the physical world; an uncanny ability to compress vast feeling into discreet moments; a voice of conversational intimacy, and an unstinting sympathy. This complete edition brings together all the poems of Carver’s five previous books, from Fires to the posthumously published No Heroics, Please. It also contains bibliographical and textual notes on individual poems; a chronology of Carver’s life and work; and a moving introduction by Carver’s widow, the poet Tess Gallagher.